Before every dive, the scientists must place their sensors and sampling devices on Jason. Jason has a front basket and two swing arms on each side. 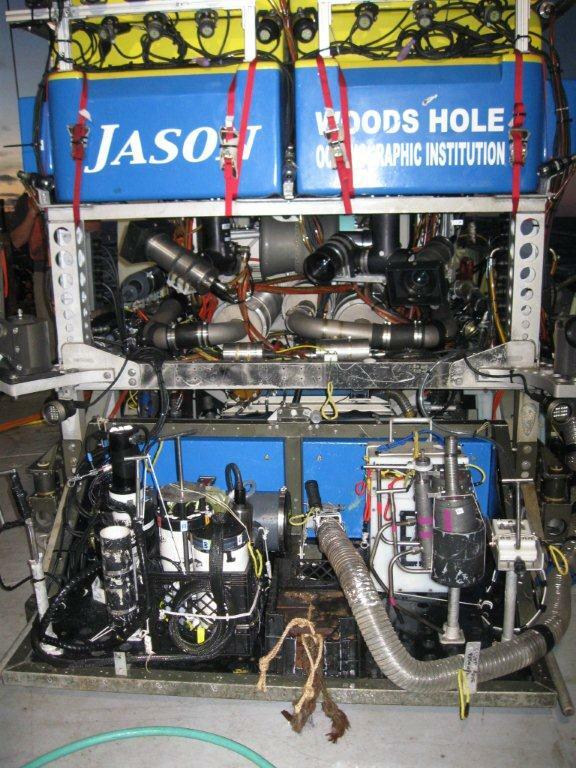 The front basket must be organized precisely so all the Jason pilots can easily access any item with their port (left) or starboard (right) manipulator. James Varnum, one of the Jason pilots, is the basket maestro or master, and we all take directions from him. Jimmy has twenty years of experience with Jason, and some of us have sailed with him during our Lau Basin cruises in the South Pacific a few years ago. 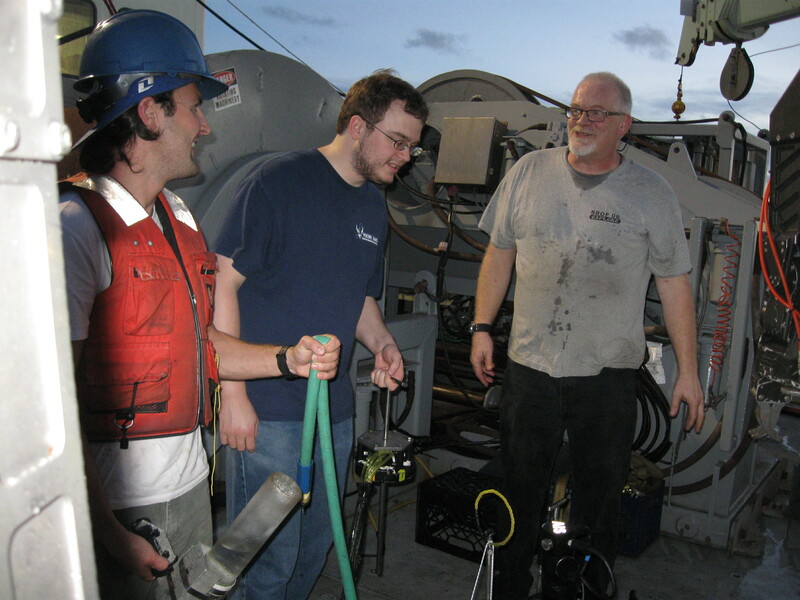 In the photo at right, Ed Dow (left), an engineer in the Jason group) and Sean McAllister finish placing gear on the Jason basket under the watchful but happy direction of Jimmy Varnum (right). The photo of Jason’s front side shows the basket just prior to a dive. From left to right are a high temperature probe, our electrochemical sensor wand, microbial mat sampler, extra steel weights, a plastic tube and holder called the “slurp gun,” holders for major samplers and a t-handle in white plastic for our in situ filtration system. Behind the electrochemical sensor wand and mat sampler are the separate electronics systems to run each. Behind the major samplers is a white “biobox,” which holds hand-held sampling devices for mat sampling. These are also used to place biological samples such as mussels or geochemical samples such as rocks or chimneys. Above the basket, one can see the various cameras Jason uses for all our video work. Trish Hredzak-Showalter and Dan MacDonald put our electrodes in the electrochemical sensor wand a few minutes before a dive.